X Rebirth was a huge disappointment. The previous X games were fantastic, if somewhat obtuse, open-ended space sims, but Rebirth was a mess. 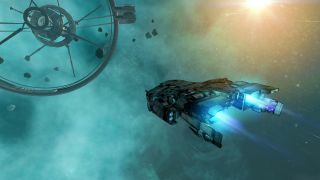 The 2.0 update that came out earlier this year made a number of fixes and improvements, but developer Egosoft kept at it, and has now released both the 3.0 update and the Teladi Outpost DLC. The announcement of the update includes links to videos explaining the major changes to the game, relating to crafting, trade, fleet captains, station builders, NPC education, hacking and sabotaging stations, and boarding ships. The full list of changes can be read here—it's pretty big—and for those who prefer to dig deeper into the details, an X Rebirth 3.0 manual is up on Steam. The Teladi Outpost DLC adds two new Teladi systems to explore, one of which contains the Habitat-class "superstation" Overwatch, one of the largest space stations ever to appear in the X Universe. There are also new Teladi ships, items, and upgrades, as well as new dangers, including the Xenon and Pirate factions that can make traveling through some sectors a very risky prospect. The DLC was initially going to be free for anyone who owned or purchased X Rebirth by November 1, but Egosoft has decided to make it free for everyone as "a thank-you gift for all X Rebirth owners." It does, however, require the 64-bit version of the game; Egosoft said in the patch notes that there will not be a 32-bit version of the 3.0 update, and that the Teladi Outpost DLC is not compatible with prior 32-bit releases.